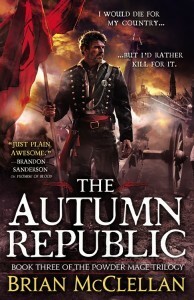 THE AUTUMN REPUBLIC – the exciting conclusion to the Powder Mage trilogy is out now! It has been quite the journey for Tamas and the many other wonderful (and/or despotic) characters inhabiting Brian McClellan’s Powder Mage trilogy. This week brings it all to a final, dynamic end, but before that…woah. Tamas and his allies are in for the the fight of their lives! On February 24th, we’ll be hosting Brian McClellan and Sam Sykes on our Google+ to discuss their new books – one which concludes a trilogy, and the other that is the start of something new! Shots will be fired. Epic fantasy will be discussed. RSVP on Google+ today, and start following Brian and Sam on Twitter for a preview of the main event. But if you just can’t wait that long to ask Brian your burning questions, check out his AMA on Reddit today.